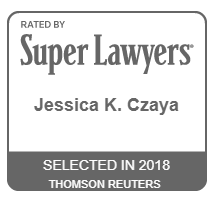 Jessica Czaya is an Associate Attorney at the Keith Taylor Law Group and is licensed to practice in Florida and Maine. Her field of practice primarily focuses on civil litigation, including personal injury and wrongful death cases, car and motorcycle accidents and slip and fall cases, as well as contract litigation, probate litigation, and business litigation and representation. Attorney Czaya attended the University of Florida where she obtained a Bachelor of Arts degree in English with a minor in Education. After graduation from the University of Florida, she earned her Juris Doctor from Stetson University College of Law. 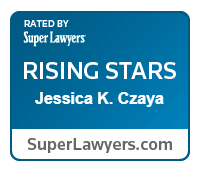 Attorney Czaya was admitted to the Florida Bar in 2012 and to the Maine Bar in 2019. Attorney Czaya has worked with the Keith Taylor Law Group as an assistant and a Legal Clerk since 2004, and has been practicing as an attorney with the firm since October of 2012. She is a member of the Florida Bar, the Maine Bar, the Florida Justice Association, the FJA Women’s Caucus, President of the Nature Coast Rotaract Club, and a Past President of the Citrus County Bar Association. 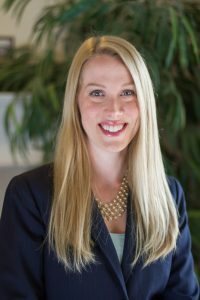 She was included in Citrus County Chronicle’s 40 under 40, recognizing young leaders in Citrus County, and selected as one of Super Lawyers’ Rising Stars three years running in 2016, 2017, and 2018.